One of late 2012's biggest tracks, Sidney Samson’s ‘Torrent’ is an electro track that comes at you with a constant flow and was hand selected by Tiësto to be Musical Freedom’s first release of 2013. 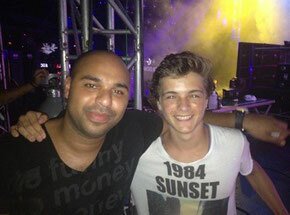 ‘Torrent’ is the product of two Dutch producers on the rise: Sidney Samson, already a household name for his fat cache of productions and remixes and Martin Garrix the young Spinnin’ Records star. Musical Freedom provides Tiësto with a vehicle to explore exciting new sounds from across dance music. From its initial release, Tiësto vs Diplo – ‘C'Mon’, the label has gone on to drop tracks from the likes of Dada Life, Hardwell, Nicky Romero, Quintino, Showtek, Tommy Trash, and Tiësto himself. It’s out on Beatport February 19.